One of the things I've never been able to do is "lock up" my brakes. If I stand on them, they bring me firmly and quickly to a stop but they just won't "lock" which is an indication of a problem somewhere. Back in the early spring 2007, I had the Master Cylinder (MC) fail which was replaced with a brand new one off of eBay. After replacing that and bleeding the system, I noticed some very slight wetness from the area where the MC bolts to the servo which probably means fluid got in to the servo when the MC failed. So that means the servo needs to be pulled and drained and if I'm going to do that I might as well have it rebuilt.......and if I'm going to have the servo rebuilt, how about the calipers, and new front and rear pads and stainless braided hoses and rear wheel cylinders and................gee......TRF has some very cool looking Alloy Drums on sale! So first things first...I've GOT TO have those drums! I know....that should probably be the LAST thing I do here but......the sale ends real soon and they look real cool. I ordered the drums from TRF on Sunday and they arrived on Thursday. I figured that installing them was about an hour's worth of work, unless Murphy's Law prevailed. But...........Murphy must of had the day off and the old drums pulled right off and the new drums were a perfect fit after loosening the brake shoe adjusting bolt. BTW.......the Brembo's weigh in at 6 lbs 10 oz and the old drums were 9 lbs so there's a small weight savings too. 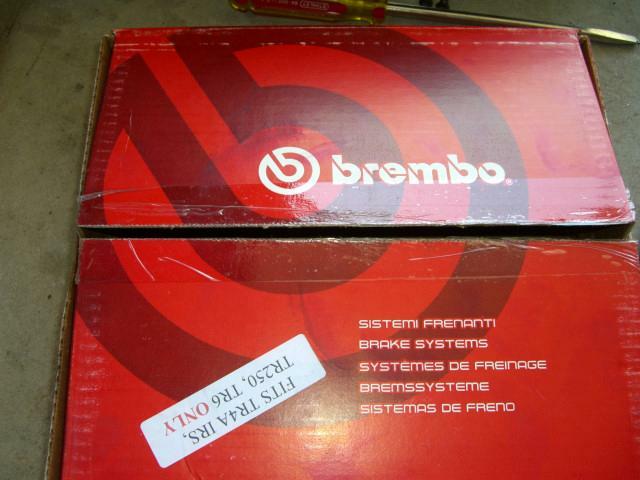 The box says Brembo and they are obviously for a TR6! In case you missed the case label, the drums also had a label! So here's my guess. 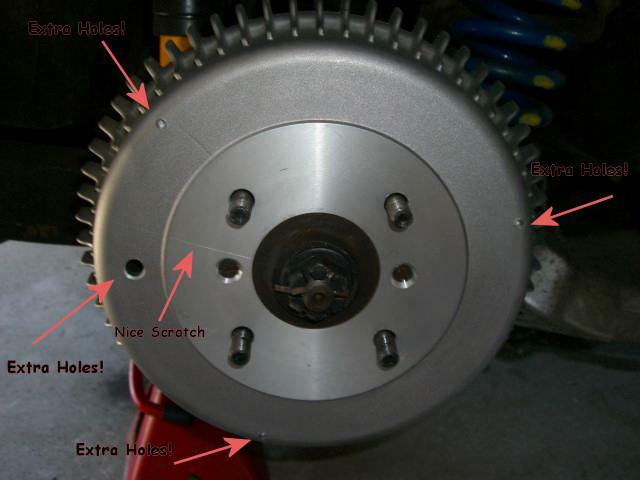 Brembo makes the drums for another vehicle (notice the extra holes/indents) and TRF buys them in "bulk". Then someone at TRF takes out a razor knife to open the Brembo box and makes a nice scratch across all the drums. He was very consistent and managed to make the same scratch on both drums exactly in line with the taped seam in the box. That would explain why neither box was still sealed. 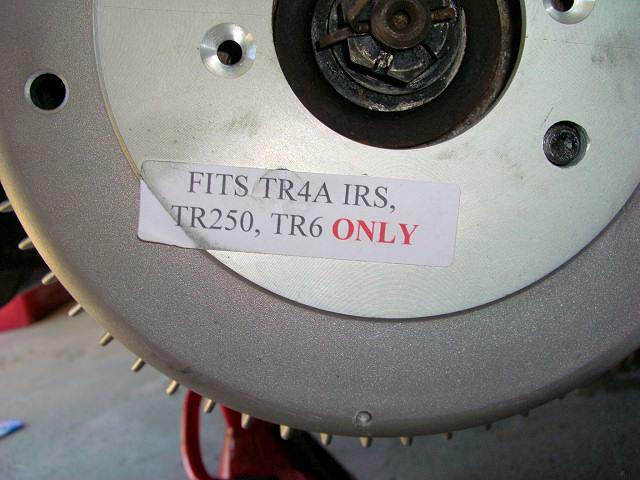 TRF then sends the drums out to a machine shop who makes the required "adjustments" for fitting a TR. TRF slaps another sticker on the drum and drops them back in the Brembo box. BUT....it is an absolutely PERFECT fit. And now the COOL FACTOR........ and the wheel completely covers those scratches. 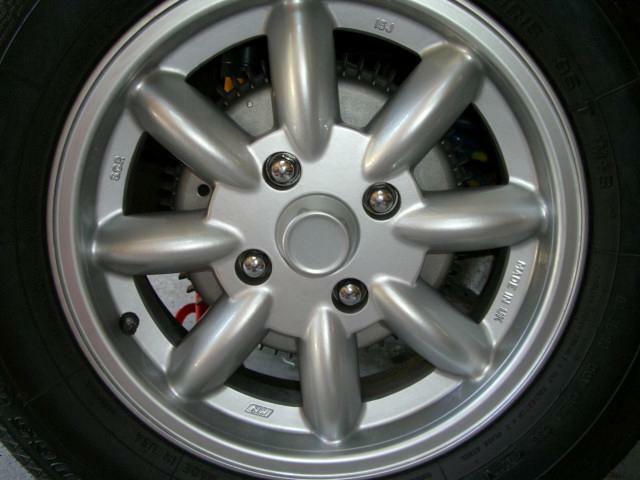 Now that I have cool looking alloy drums, I'll be doing some research on where to have the servo and calipers rebuilt. Fast forward to January and this decision has been made with all brake components having been ordered from Ted Schumacher, TS Imported Automotive including: rebuilt calipers, rebuilt servo, Kevlar pads and shoes, S/S hoses and all new springs and fitting kit for the rear. The only exception being an upgraded Morgan rear brake cylinder from Kai Radicke of Wishbone Classics. This is a slightly larger bore cylinder which equates to a little more stopping power at the rear. Next up........new brakes on all four wheels.